Since my last blog we have been trying to stick to a schedule of working from home Monday, Wednesday, and Friday. Then we go out and have fun on Tuesday, Thursday, and of course weekends. Last weekend we went to a Washington, D.C. landmark called Ben's Chili Bowl. I had a vegetarian chili dog and it was tasty. Jeff had the real one. After lunch we went to the museum inside the National Archives and then went upstairs to the rotunda to see the Declaration of Independence, the Constitution, and Bill of Rights. Sorry no pictures were allowed inside. On Sunday our football teams played each other. We couldn't get the game on TV so went to Buffalo Wild Wings to watch it there. 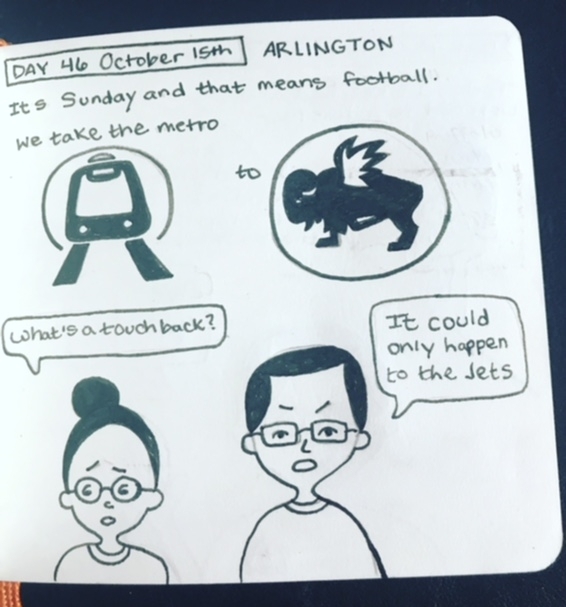 My team won and that makes me happy, but that did look like a touchdown. Monday we stayed home and worked. I got to catch up on podcasts while I worked on illustrations while Jeff enjoyed Star Trek playing in the background as he worked. 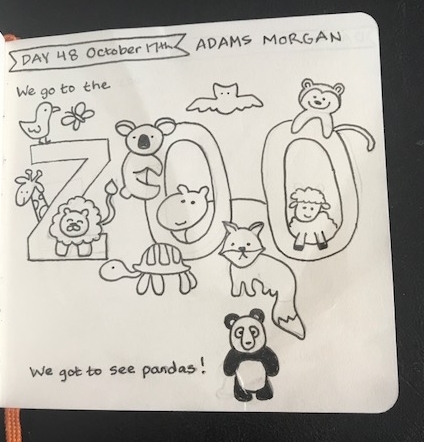 Tuesday we went to the zoo. It started off very slow. We couldn't find any animals that weren't in hiding somewhere except for a peacock and some chipmunks and squirrels that ran across the path. Then we heard there was a Sloth Bear feeding. We figured that was the best way to see some animals and it was a good decision on our part. From then on we saw lots of animals including Giant Pandas which Jeff and I had never seen in real life before. This orangutan was very fascinated with this woman. 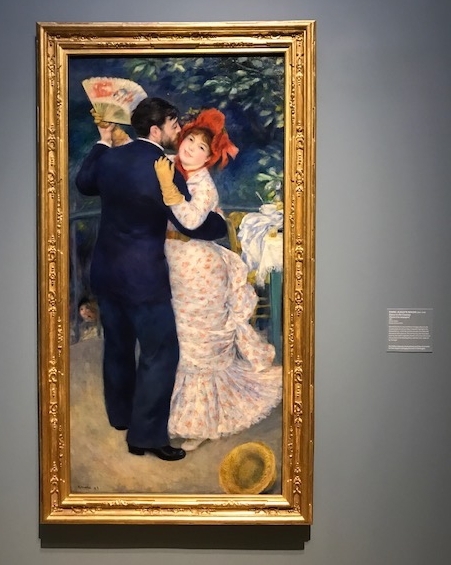 He would not stop looking at her and even smeared his feces on the window for her. What a connection! Wednesday was another work day but yesterday we had a date day and night! We went to the movies to see "Professor Marston and the Wonder Women" which is about the man who created Wonder Woman and the women he took inspiration from. I read an outstanding book on the same topic called The Secret History of Wonder Woman by Jill Lepore. We both liked the movie even though it is not doing well in theaters. If you have any interest in seeing it you better act quickly. After the movie we went to The Phillips Collection. 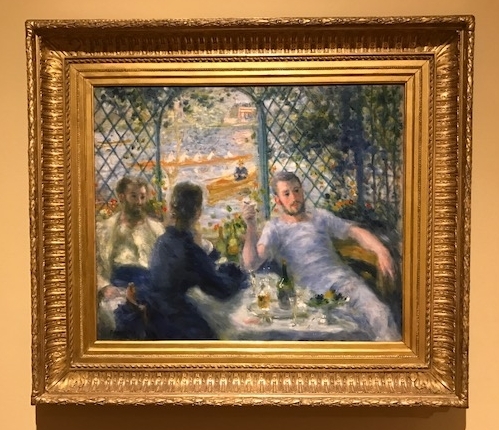 Jeff and I weren't blown away by the collection itself but they had an exhibit called Renoir and Friends that we loved. 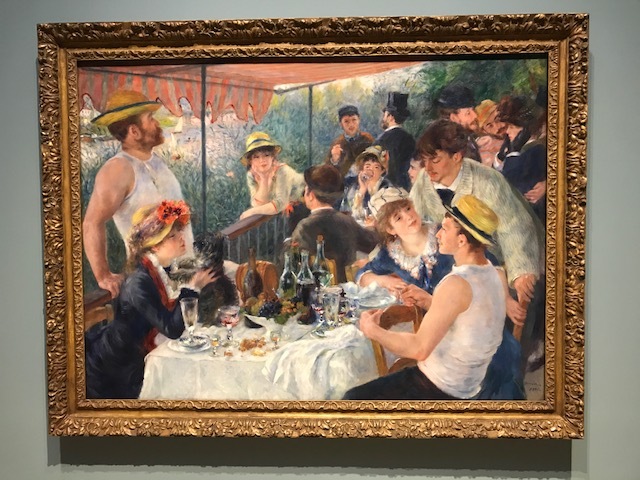 The highlight of the exhibit was this painting "Luncheon of the Boating Party" which is part of their permanent collection and is considered one of Renoir's greatest paintings. Afterwards we went to my favorite bookstore, Kramerbooks, and favorite barbecue joint, Smoke & Barrel, for dinner. They have many yummy vegetarian options.